Independence Pass, a paved mountain corridor that traverses Colorado's Sawatch Range, grants access to hiking trails, climbing routes, campgrounds, as well as breath-taking vistas and an unforgettable alpine experience. 32 mile stretch of highway linking Aspen, CO, to Twin Lakes, CO. Provides public access to recreation grounds for mountaineers, hikers, road cyclists, anglers, and motorcyclists. Camping restricted to designated areas. Mountain pass closes due to weather from October through May (varies each year). Check http://www.cotrip.org/ or call (303) 639-1111 for updated road information. 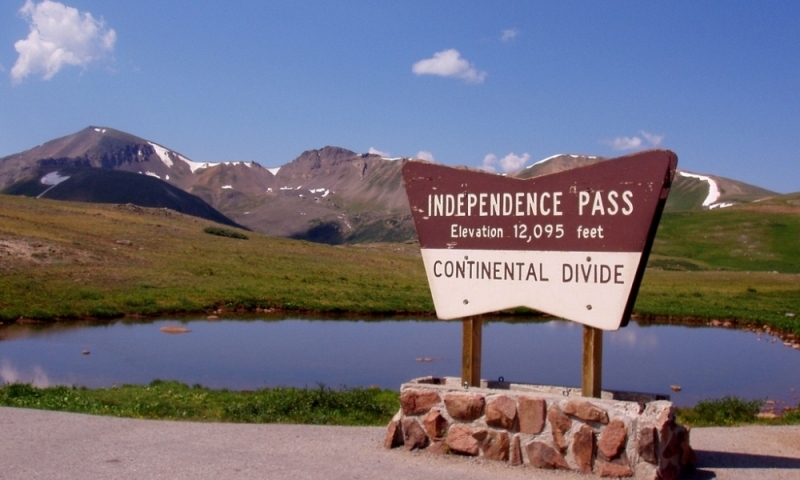 At 12,095 ft., the summit of Independence Pass marks the Continental Divide. Independence Pass, a spectacular scenic byway, offers public access to federal lands within the White River and Pike & San Isabel National Forests. The road (with switchbacks not for the faint of heart) navigates through aspen groves, granite walls and meadows, with alpine tundra at its peak. Various designated campsites provide base camps for enthusiastic outdoor-types of all stripes and entrance to numerous trails that mark the slopes of the Sawatch Range. Independence Pass refers to the 32 mile stretch of Highway 82 that connects Aspen, CO, to Twin Lakes, CO.
Due to harsh weather conditions that can make the road unsafe for drivers, Colorado Department of Transportation closes Independence Pass for the winter, often in late October, and reopens around Memorial Day. For current road closure information, visit http://www.cotrip.org/, call (303) 639-1111 or dial 511 from inside Colorado State. Surrounded by millions of acres of public access land, Independence Pass can prove to be the ultimate wonderland in warm and cold weather seasons. Hundred of miles of trails provide entrance into wilderness environs, ripe with possibility for hikers, anglers, and horseback riders. Skiers and snowshoers, too, can find adventure in the snowy months. The Grottos Trail - With a trailhead found just under a mile past Weller Campground, this system of trails offers picnic areas and interesting natural sights, like ice caves and a waterfall, and is easy enough for novice hikers and children. Difficult Creek Trail - At 3 miles in length (one way), gaining about 1200 feet elevation, the majority of this moderate hike follows maintained trail along Difficult Creek, offering views of Aspen and Independence Pass. The trailhead is found at Difficult Campground, making it convenient for overnight campers at this site. New York Peak - At 4.2 miles to summit, with over 2200 feet elevation gain, this hike makes for a strenuous day. The trailhead can be found by turning onto Lincoln Creek Road off Highway 82 and driving 3 miles on road that necessitates a high clearance vehicle. A topographical map will be a highly useful tool for this hike. For more hikes in this area, visit the White River National Forest Website. In the winter, the closed Pass road offers cross-country skiers 11 miles (one way) of packed trail. With a gentle slope and wide berth, this route is heavily used for recreation by skiers and hikers (as well as snowmobilers). Most skiers turn around near Independence Ghost Town or Lincoln Creek Road. Beyond these points, avalanche danger grows significantly and proper safety precautions should be exercised. Parking is easily available at the end of the plowed highway about 5 miles outside of Aspen. Climbers can find access to sport and trad routes, as well as many bouldering sites. Grotto Wall, located between Weller and Lincoln Creek Campgrounds, on the Pass road, offers myriad routes for all levels of climbers. Independence Pass and the surrounding wilderness offers hundreds of acres of fishing heaven. From Lincoln Creek Road, off Highway 82, New York, Petroleum, Tabor and Ruby Lakes can all be accessed for rainbow, cutthroat and brown trout. Visit www.fs.usda.gov/activity/whiteriver/recreation/fishing for a comprehensive list of sites. Most hiking trails are open to horse use. Familiarize yourself with trail descriptions and regulations before setting off on your trip. The USFS regulates camping to designated sites only. While a few campsites, such as Lake View, require registration, most are first-come, first-served. Many trailheads for day hikes are located at campgrounds. Weller Campground - Located on Lincoln Creek Road, this site does not accept reservations, carries a five-day, two-car limit per site and offers potable water, firegrates and vault toilets. Perfect for access to trout fishing and hiking trails. Difficult Campground - Located just a few miles East of Weller Campground, along Highway 82 and the Roaring Fork River, this campground offers similiar immenities to the former, with an eight-person limit per site. Unlike Weller, however, Difficult offers a by-reservation-only Group Site with a 50 person capacity. Visit White River National Forest for more information on campsites. The Independence Pass Foundation designs and implements projects that help preserve and maintain the corridor. Red Mountain Pass in Southwest Colorado is another amazing and scenic route.